Do The Golden Globes Predict The Oscars? Tina Fey, left, and Amy Poehler arrive at the 72nd annual Golden Globe Awards at the Beverly Hilton Hotel on Sunday in Beverly Hills, Calif.
Our nation’s drunkest entertainment awards show, the Golden Globes, took place Sunday night; the Hollywood Foreign Press Association — several members of which are neither foreign nor members of the press — entertains the world with awards for the best television shows and movies of the past year. Richard Linklater’s “Boyhood” — an ambitious, decade-spanning film about the changes that happen to a young Texan as he grows into a slightly older Texan — won best drama motion picture. Wes Anderson’s “The Grand Budapest Hotel” — an ambitious, decades-spanning film about the changes that happen to the Grand Budapest Hotel — took home the award for best musical or comedy. So, after an evening of jokes from two of America’s finest comedians, the main thing of interest is what the Globes’ results mean for the film awards show that actually matters, the Academy Awards. The answer? Not much! 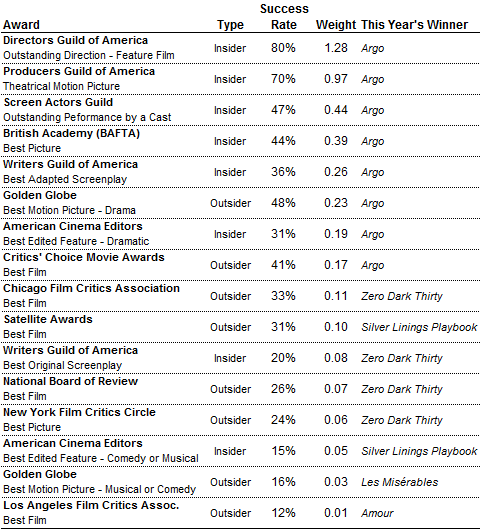 The Golden Globes rank sixth, with a 48 percent win rate as of 2013; the Director’s Guild of America Awards was the most highly correlated with best picture success. Factoring in the past two years — with “Argo” and “12 Years a Slave” winning both the Globe and the Oscar — the success rate for Golden Globe drama winners stands at about 49 percent. So, about even odds. If you really want insight, keep an eye on the DGA Awards on Feb. 7. Despite going for “Gravity” last year, they’re still the best game in town.